Visitors have accessed this post 2145 times. In this tutorial, we are going to learn about animation-duration. 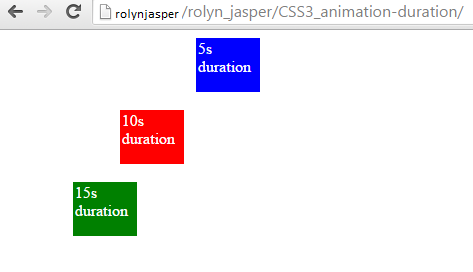 The animation-duration property specifies how many seconds or milliseconds an animation takes to complete one cycle. time - it specifies the length of time an animation takes to finish. The default value is equal to 0s. initial - it specifies that the value of the property should be set to the default value. inherit - it specifies that the value of the property should be inherited from the parent element. This example shows the use of the animation-duration property in a three (3) different value of time. Hope that this tutorial will help you a lot.